A team of university researchers are developing a range of robotic clothes to help disabled and elderly people live more independent lives. 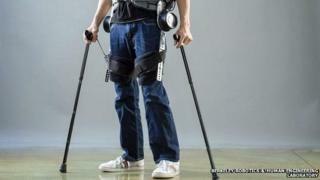 Researchers from seven UK universities are working on clothes to enable people with mobility problems to move easily and unaided. The team will work on "smart" trousers and socks which could help vulnerable people avoid falls and climb stairs. One of the researchers is Dr Arjan Buis from Strathclyde University. He said: "The mobility problems we are addressing take different forms. "They can be found in people who need rehabilitation after breaking legs or other bones, in people with chronic conditions such as spinal cord problems or muscular dystrophy, and in frail elderly people. "We want to help these people not only to become more mobile but to have power behind their mobility. "We also want to ensure they have dignity, by being able to put on this clothing themselves." The research also involves the universities of Bristol, Southampton, Nottingham, Leeds, the West of England and Loughborough. The soft clothes will use bionics, reactive polymers and artificial "muscles" to help the user. The researchers hope the clothes will alleviate problems caused by existing devices, such as poor circulation and damaged skin, and will reduce healthcare costs. Those involved in the three-year project, which is being funded by Engineering and Physical Sciences Research Council, hope to begin testing the technology in a year. A spokesman from Age Scotland said: "Age Scotland is encouraged by any research that looks at how technology can be used to support people with reduced mobility. "Reliance on helpers to move around the house or to get out and about can limit people's options in the life they would like to lead so anything that increases the opportunities for independent living is positive. "With any new and developing technology, it's difficult to say whether it will provide the silver bullet to help people with mobility issues. "What is a positive step forward is that different possibilities are being researched and investigated to provide a full range of options to give people choices that will suit their individual needs. "